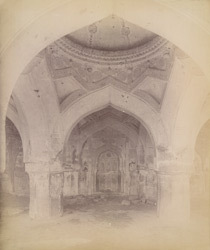 Photograph of Ain-ul-Mulk's Tomb from the Archaeological Survey of India Collections taken by Henry Cousens in the 1880s. Ain-ul-mulk was a noble at the court of Ibrahim I (r.1534-58) and his tomb was at Ainapur, north of the city. The tomb of Ain-ul-Mulk built 1556 is a massive square building surmounted by a dome with tiny minarets. The interior walls are richly decorated with plaster tracery with different motifs such as discs or medallions, chains, lotus buds, ornamental Arabic writing. This view shows the details of the pendentives of the dome.